As far back as I can remember, and for decades before that, the issue of banks and farmers has been a sore point. Banks are bastards who take the farms off drought ravaged farmers. The family may have had the farm for generations but now it is being taken away for reasons outside their control. Now I am not a farmer, but it seems to me that something is going wrong if after a few centuries it is still a problem. Maybe we need to think of a better way for the two interdependent parties to work together. I guess it is useful to state a few obvious facts. Technology is not something the majority of farmers reject. Farming has always been at the forefront of innovation. It is inevitable that income will fluctuate. Control of world output and world prices is not possible. Investments made to plant crops, or stock levels have a significant level of risk. The last point is important. It relates to risk. But who bears the risk? The farmer is the one who will be most impacted if the risk turns to reality. To a much lesser extent, the bank may not recover all it’s loans. The impact of the risk is going to be far less on the bank than on the property owner. A few basics of risk management are relevant at this point. Risks have 4 stages. Risk identification. Identify the significant risks. Risk quantification. Understand their potential impact, and probability that they will occur. Risk Control. Monitor risks and take action where required. Risk quantification involves looking at the Impact of the risk (e.g. Catastrophic, High, Medium, Low) and the Probability (e.g. Almost Certain, Highly Likely, Likely, Unlikely). 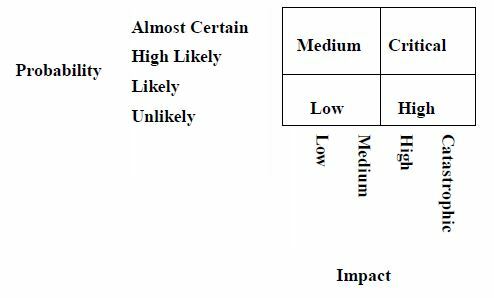 Once you have decided these criteria, you can create a matrix to rate the risk as Critical, High, Medium, Low. 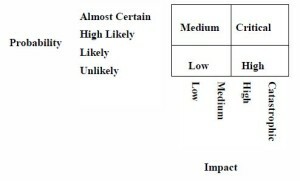 Using the matrix on the left you can rate the risks for a particular situation. They can be rated from those that are critical risk down to those that are low risks. Obviously the critical risks are the ones that you need to focus on. It seems to me, the risks of investing in farming are much more substantial than investing in say property. So how do you mitigate the risks? At the moment, the farm owner is almost totally responsible for managing the risk. When risk becomes reality, the bank says that the farmer is totally responsible for the incident occuring and must accept the consequences. What if we take another approach? What if the bank takes a bigger share of the risk? What if the bank wears some of the losses as well? There are a number of implications so let me go through them. Just to keep the example easy to understand, say a farmer takes out a loan for $1 million with an interest rate of 10% . At the end of the year the farmer has to pay the bank $1.1 million. Failing to do so means he or she forfeits the farm. What about this scenario. Assume it is a wheat property. The bank loans the money but says if the farm can produce a certain tonnage of wheat, and the wheat price is a certain benchmark level, we will charge you 10%. If however the price is under the benchmark price, you will not owe us $1.1 million. You will owe us less. If the price is 50% of the benchmark price, you only owe us $800,000. On the other hand if it is over the benchmark price, you owe us more than $1.1 million. If it is 50% over the benchmark price you owe us $1.3 million. The same goes for production. If the production is down, the farmer owes less. More and the farmer has to repay more. Of course it is a sliding scale. The difference is the bank shares the risk with the farmer. In return they get a potentially bigger reward. It would certainly make them look closely at their lendings. It also raises another aspect of the relationship. Maybe the bank would want to have input as to how the money was spent. Should the farm plant corn, wheat or cotton? How many cattle should they run? Whilst this may seem a restriction on the landowner, there could also be some benefits. The bank would need to develop more expertise in rural technology and also forecasting returns for primary produce. Let’s take a hypothetical example. Say a bank is involved in lending to a successful cattle property in WA. On this property they use a new technique for avoiding a bovine disease. A similar property on the other side of the country wants a loan. The bank might say let’s consider using the technique developed in WA for avoiding disease. It becomes part of a joint business plan for the life of the loan. The bank is using it’s national experience through it’s network to minimize risk. 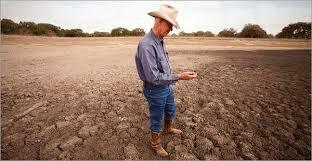 The farmer is using the resources of the bank to minimize his or her risk. The bank is no longer just interested in receiving repayments on time. It has an incentive to maximize the profit from the farm. I heard an interview on the radio a year or so back that changed my perception of what farming was all about. The discussion was about water rights. The city press constantly criticise cotton farmers for using too much water. The guy being interviewed was asked why he grew cotton. His answer was that he is given an allocation of water. In one sense he does not worry what that allocation is. He must then decide what is the best return he can get from that amount of water on his property. It might be a big wheat crop or a small cotton crop. It doesn’t matter. The water is the fixed in the equation, not the type of crop. It turns the preconceptions we in the city may have of how things work on their head. Maybe this suggestion to share risk won’t work but it seems to a city dweller that our rural industries should not necessarily have to work under financial concepts designed for cities. People in the country may find all sorts of holes in this approach but hopefully it will get minds working to challenge the existing models.